I'm slow-moving this morning, came back from San Francisco with a little bug. But, I'll try to make up for the tardiness with a big giveaway from Maxton Men, a super-cool men's e-shop that carries Herschel backpacks and duffels, really really great colored shoelaces, and tons of fun gentleman's accoutrements that are perfect for sprinkling into the tomboy wardrobe. Plus, they always ship for free, no matter the price! To enter to win a $100 certificate to Maxton men: Like them on Facebook and leave a comment below. I'll pick a random winner Tuesday morning at 9am PST. Good luck! Maxton Men is also extending a 15% discount to Tomboy Style readers. Enter the code TOMBOY15 when checking out (good through April 21st). Especially loving the Hershel backpacks and duffels! LOVE IT, been eyeing a Hershel bag for months. It would be perfect for my bike ride to work! I love their notebooks and bags. Ooh, I'd love to treat my husband to something from Maxton Men. Thanks for the chance to win. xo. I have been collecting Herschel, would love to add to the collection. I could use those bags, in every color! i could use a new backpack for summer adventures! Sign me up for a Hershel duffle, please! Love to find new stores! oooooh this is fabulous. I NEED one of those backpacks for summer camping trips and hikes!! I'll take one of everything, please! Great shop! Love their collection. Classic! I love the Fred Perry holdall's and the Herschel Supply Little America backpack in black. The camel straps are a nice detail. SUPer cool. Love those checkered pocket squares. I love it! Give me a tie, a Coach belt, a Fred Perry bag, and a speckled tie, any color, and I'd be happy as a peach! Love those back packs for spring! Liked on FB too! oh hershel bag, yes please! Groovy stuff. Ideal fishing backpack! Also, the stuff in the office section is very tomboystyle. Ooh, what a fun giveaway! This is great. Thanks so much. Can't go wrong with anything on the Maxton Men site! I'm down for this man. Thanks for sharing--they have some great things! I've been looking at those Hershel Backpacks for A LONG time ... I liked them on Facebook (Sarah Key), too! I've been eyeing a Herschel bag for a while now...if I won I would definitely buy one. And those striped socks....I think I need them! Those ninja knife magnets are so funny. I could see them hanging on my brothers' refrigerator. So cool! I made sure to like Maxton Men on Facebook. Best of luck to everyone who enters this giveaway! Love those Herschel duffel bags! mmm I love maxton men...they carry my favorite old calgary laptop/phone cases, and I love all the notebooks and pens. Love! It's all so charming. I can just see summer tooling around on my bike with one of their great backpacks. giveaway and a new site find... great post. thanks! I want to be a Maxton (wo)Man! Oh my goodness, that Herschel backpack in khaki! Swoon. Wow, I can't believe I didn't know about Maxton Men sooner - what a great collection of products. The chestnut leather card case wallet is calling my name! Just bought a motorcycle. Saving now for a Hershel bag to carry my things! This is an awesome giveaway! Thanks for the chance! They have such a great selection of Herschel backpacks! I've been looking for the perfect backpack for weekend trips/long bike rides, so I would totally get one if I win! Just so happens I'm on the search for a backpack to use with my shiny new (rackless) road bike on commutes to work! Wow! Awesome. Hope I win!!! Love your blog. Ooh I love that backpack, it would be great for camping and hiking. The navy backpack is to die for. I love them! Such a great offer! I need a new backpack! Ooooh! I like this a lot (and I liked them on FB) sirius.venice (at) yahoo (dot) com. yup, again borrowing from the boys. ooooh, thanks for introducing me to this company! Can't tell you how much I love the Herschel backpack! LOVE the duffels. Racing stripe wallets are nice, too. I love Herschel backpacks! I'm glad to know about Maxton Men now--I'll definitely have to check them out a bit more. I liked them on FB, and could definitely use a backpack for next semester! What wonderful things to add to any boy or girl's wardrobe!! I'm really loving that backpack, very cool. Love love love the bags!! I'm diggin' their bags. All of them. Ya I want camping gear! I have been DYING for a Herschel backpack. Fingers crossed! Can I make the cufflinks earrings, please? Excellent. Wow. Maxton has tons of nice stuff! Love love love the duffel bags! Not interested unless you're a MAXTON MAN! liked them on facebook. nice giveaway! In love with the bags!! Well this is the best giveaway. Just finished browsing their site - lovely! I think I found a new favorite, thank you! Backpacks are awesome! But I think I would go for the big headphones. I love your website; very inspirational! awesome. Glad to know others cruise menswear sites! Oh boy, I would love to win this! I love all their bags! Sweet giveaway! 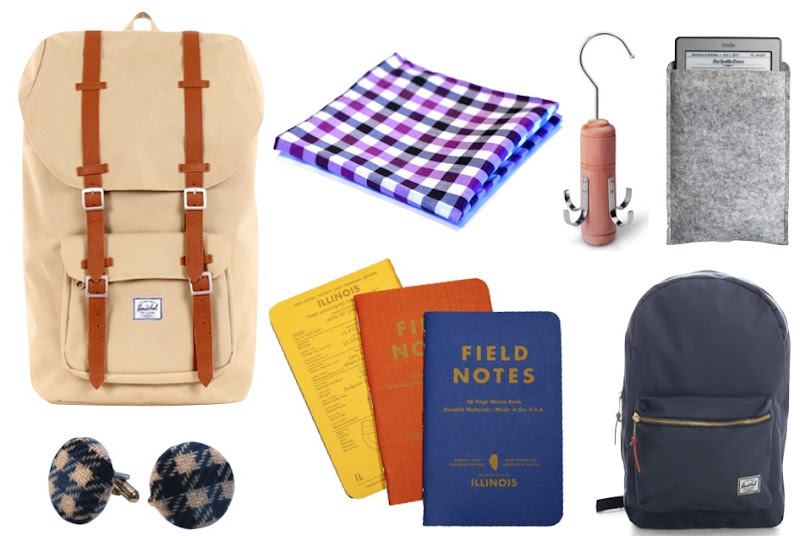 Loving the Herschel duffer bags, and those field notebooks! I love Maxton Men far far too much. I like them on Facebook on my page (Back Down South). Would love to win, obviously! Maxton Men has the BEST customer service, I LOVE THEM!! Ah, nice stuff! I like(d). I'm getting that Fred Perry navy shoulder bag regardless, but it would be so much sweeter to buy it with a gift certificate! Ooh, I'd give this to my husband if I won, but he'd probably want everything! I like them on fb - my username is Aimee Gee! Thanks for the giveaway! Liked on FB. I want to win! menswear should be considered a form of women empowerment. Love the Q&A with my mom- Jeanne. Those backpacks are rad! Could use some great accessory items. I liked them. Love that stuff! Liked! What a lovely prize. great giveaway! i especially love the bags & cufflinks. AWESOME! :) Would be lovely for a girl as well. Would be perfect for my super supportive man, who has a birthday Saturday! i hope you don't mind that i'd spend this on myself, rather than a dude? I LOVE this store! Honestly don't know what I would get but I am sure I could find something. would love to get the herschel back pack I've been eyeing! Would love to get that giveaway! Must have this in order to complete my grid! I need a new Field Notes notebook! Oooh! I wonder if I'm too late?! Hi!! I really love your blog. I have liked them on facebook. This is a great giveaway! Thank you very much. Yay Men!!! Of course we love them for more than their style! Thanks for the great promo. I look forward to your posts every day! OoooOooo their stuff looks really cool! Looks like an awesome giveaway! congrats on your book succsess. I finally got Internet here in Germany so I could catch up. Best of luck! I am drooling for the hershal backpack. Never has the statement effortless style been so true! Never has effortless style been so true!